The particle at the center of the field of view in this image is a paint flake. The paint particle can be identified by the uniform size of the pigment particles distributed through the transparent vehicle (binder). This is best seen at higher magnification. The particle will be seen to be a suspension of minerals fillers, opacifiers, and pigments to produce the desired effect. This is a white paint and titanium dioxide (rutile) is both the opacifier and pigment. The filler in this case is probably fine clay or isotropic silica that is smaller than one micrometer and about the same refractive index as the vehicle. Under those conditions the filler is invisible unless the paint is solvent extracted or ashed. 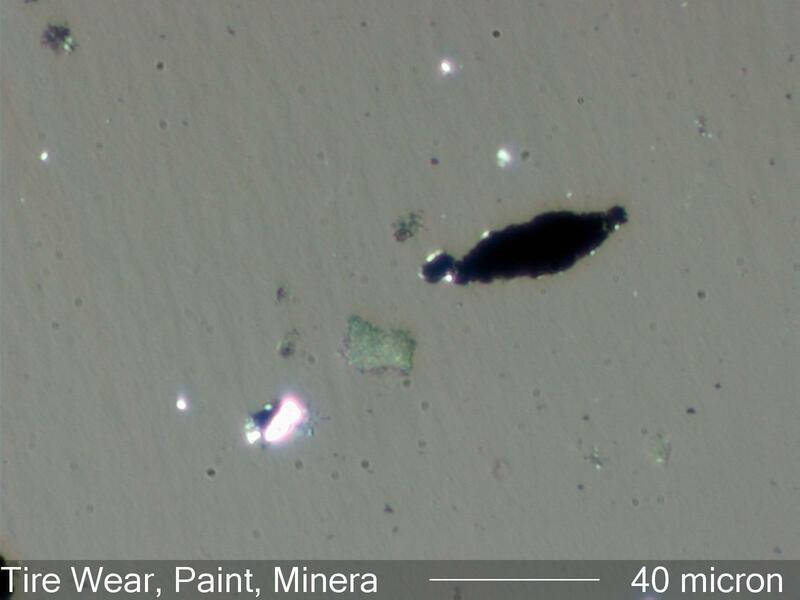 The paint particle would have a titanium and a silicon signature. Tire wear particles may be generated and introduced during the assembly or delivery of the transformer. They may also be a foreign contaminant as a result of unfiltered air exchange in the headspace of the transformer. The presence of these particles indicates the degree of control exercised over the environment under consideration.